[00:38] Microsoft Ignite: The Tour continues to go full speed ahead in January, with stops in Toronto, Singapore, Tel Aviv, and Milan! [01:12] The CsharpFritz 2018 Year in Review - Jeff's insights on Twitch streaming are great! Share your favorite technologies/innovations in the comments! Also, let me know what you think of my excellent hoodie! Please leave a comment or email us at [email protected]. That's all for this week. Have a great weekend, and we'll be back with more from the blog next week. Welche Themen haben Werbetreibende im vergangenen Jahr besonders interessiert? Welche Trends haben die Werbebranche beschäftigt? Um Antworten auf diese Fragen zu geben, haben wir uns angesehen, welche Artikel auf Think with Google 2018 besonders häufig von unseren Leserinnen und Lesern aufgerufen wurden. Nutzerfreundliche mobile Websites, Onlinevideos, die digitale Transformation, Kooperationen, Chatbots und das Omni-Channel-Marketing werden nur einige der Trendthemen in den nächsten zwölf Monaten sein. 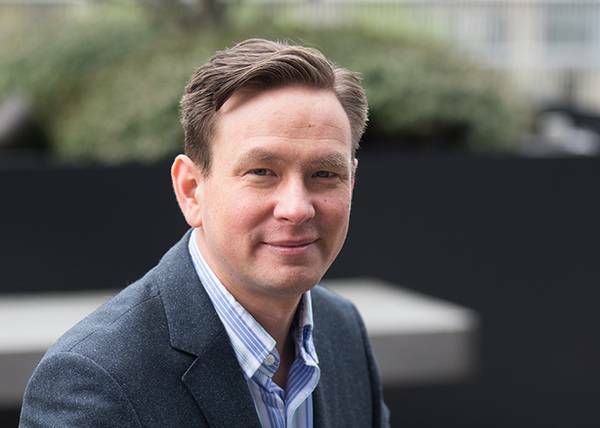 Wir haben Experten aus der gesamten EMEA-Region gefragt, welche Umbrüche und Branchenentwicklungen sonst noch Einfluss auf die digitalen Marketingstrategien 2019 in diesem Wirtschaftsraum haben. These techniques can be extended beyond basic ad serving into other scenarios on a fashion retailer’s website. When shoppers use the search box on the fashion retailer’s website, these techniques can improve product search result relevance. Moreover, search results can be tailored to an individual shopper’s fashion taste by integrating additional permissioned signals such as individual purchase behaviors and search history. These signals can also be used in product recommendations to rank products by default if the search query box is not used. In search advertising, keywords specified by the advertiser are traditionally matched with the query and product description to rank relevant product ads. However, in the fashion industry, it is costly for advertisers to manually specify and bid on all possible fashion attribute keywords. Since an advertiser’s keywords determine how product ads are ranked, the potential to maximize relevance and thus user clicks are limited by the selection of those keywords. 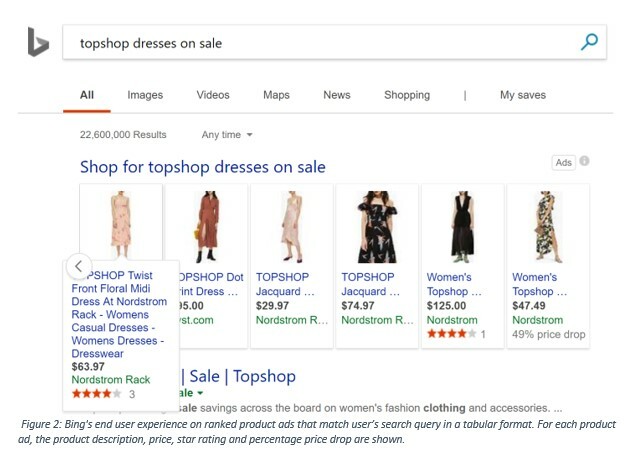 For example, when a Bing user wants to search for dresses on sale from a fashion brand name, she may issue a query such as "<brand name> dresses on sale". Consequently, the advertiser’s initially specified keywords "<brand name>" and "dresses" will match a huge number of potentially relevant dresses from the fashion brand name. However, dress descriptions may contain many other fashion attribute words like “floral”, “jacquard” or “bodycon” that could closely correlate with the relevance of a given product to the query but were neither specified by the advertiser nor typed in the query by the user. Therefore, it is difficult to identify and properly rank the few most relevant dresses that most users will like, just based on the advertiser’s initial keywords. Traditionally, ads were ranked based on keyword matches between the search query and ad description (e.g. "<brand name>" and "dresses"). Now, Bing can rank product ads based on other words in the product description that did not appear in the query (e.g. "floral", “jacquard”, “bodycon”) or in the initial set of advertiser’s provided keywords. Since each product description’s relevance is ranked in relation to a user’s query, we consider each Query-ProductDescription to determine the best ordering. This Query-ProductDescription concept is what we refer to as the basic ranking unit. Query-ProductDescription examples for the query “<brand name> dresses on sale” are shown in Figure 3 below. Unmatched words in each new Query-ProductDescription are colored red. For a given query, the importance of unmatched words in a product’s description can be learned from other products that were clicked in the past for this query, and that contain the same unmatched words. Specifically, Click Through Rate (CTR) captures how much the user likes a product. For example, given a past identical query “<brand name> dresses on sale”, if the product “<brand name> jacquard midi dress” has higher CTR than another product “<brand name> bodycon midi dress”, you can infer that the unmatched product word “jacquard” is likely more important than “bodycon”. Importance in this case refers to popularity. “Jacquard” refers to dresses with an intricately woven pattern while “bodycon” refers to tight fitting, figure hugging dresses. Feels like jacquard dresses are comfortable hence more popular than bodycon! To extend the amount of data that can be used to find additional important words, you don’t have to limit yourself to identical queries issued in the past (“<brand name> dresses on sale”). You can also look at past queries that were similar such as “<brand name> dresses online” that contains the same query keyword “dresses”. 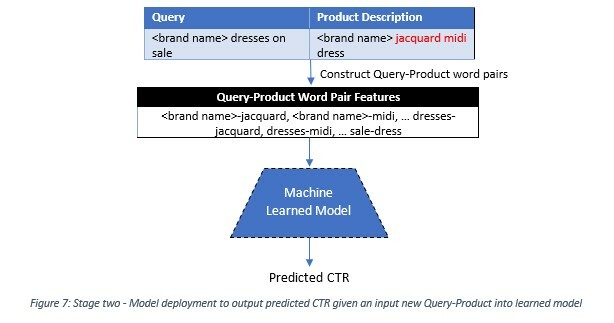 To enable learning from such similar queries, the query keywords (“dresses”) that co-occur with unmatched product description words are represented as Query-Product word pairs like “dresses-jacquard”, “dresses-bodycon”, etc. Query-Product word pairs are then used as features to represent the original Query-ProductDescription strings. 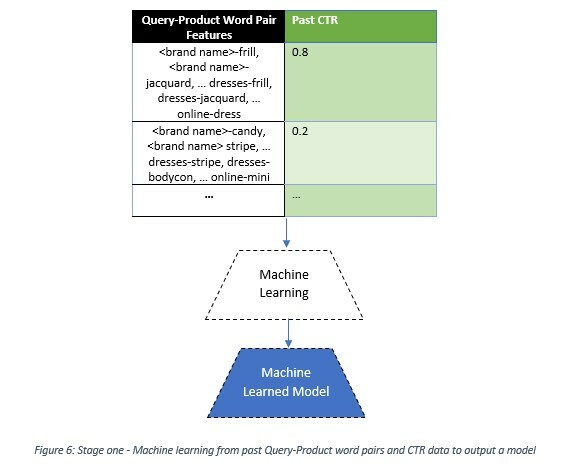 Once the Query-Product word pairs and CTR data are prepared, they are fed as training data to a machine learning model to learn Query-Product CTR patterns. When the system is deployed, and a user enters a previously unseen query, the model will generate corresponding Query-Product word pair features for the query and product descriptions from the fashion advertiser’s catalogue. It will then use them to predict the CTR for each product. Products with highest predicted CTR will be ranked highest. In summary, product ads are ranked based on descending order of predicted CTR to maximize ad relevance and user clicks for the query. This avoids the hassle of fashion advertisers having to specify all keywords manually. 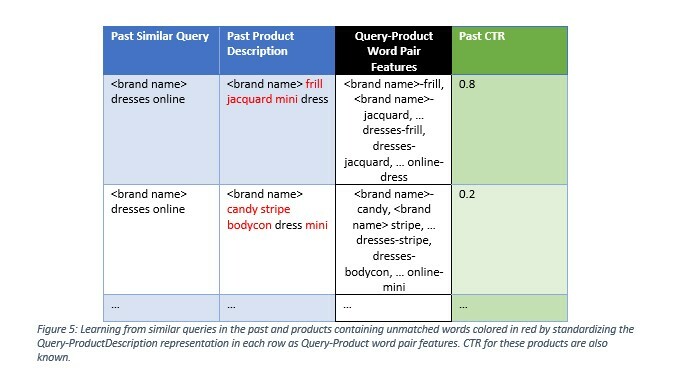 Interestingly, using this technique of CTR prediction, fashion retailers can also evaluate the importance of the query ad keywords they entered initially for bidding. You may be thinking that product description words cannot be the only factor that influence a shopper’s browsing and buying behavior. And you would be right - Bing goes beyond ranking strictly based on product descriptions. Other attributes that further advance the relevance of product ads ranking include product prices provided by the advertisers, numerical features like the product’s display price and percentage discounts, or even raw product image pixels are also used together with product description features to represent each product and contribute to ranking. The techniques would also apply if a fashion retailer wanted to implement product search on their own website. These fashion retailer website scenarios enable more relevant product search experiences to shoppers, increasing user satisfaction and click through rates. Presented ranking techniques can similarly be used to maximize the relevance of product search results for shoppers who simply browse for products using the search box. As with the previously described techniques, they are effective even if the query entered by the user does not perfectly match the product description. Product search results would also in this case be ranked by predicted CTR with the same Query-ProductDescription. Because individual fashion tastes are subjective, as a retailer or an advertiser you may want to improve product relevance further by tailoring it to individual shoppers. Building upon the general search use case, you can extend this technique to support relevant and tailored search experiences. If you have obtained a user’s permission to use their search history of products purchased or browsed, you can append the shopper’s individual context as the third component to the Query-Product ranking unit. The new basic unit of ranking would now become a Query-Product-IndividualContext triplet. Individual context information that can influence a shopper’s behavior could include descriptions of past products browsed and bought by a given shopper. In yet another scenario, when a shopper first lands on the website’s product catalogue page without using the search query box, fashion retailers can also tailor the default ranked list of recommended products. To achieve this, the ranking unit is modified by removing the Query component so that the fundamental unit of ranking becomes the Product-IndividualContext pair. We are hard at work on making the user’s experience even better. One of the future directions includes customizing ranking to fit consumer behaviors that are unique to the fashion industry. For example, fashion retailers may want to combine the importance of past clicks to given products with seasonal fashion trends, and individual shopper’s evolving fashion tastes to even better predict future behavior. The greater vision is to help fashion retailers large or small to showcase fashion in a way that is cost effective and beautifully relevant for each shopper. For more details on this ranking technique’s context, you can refer to Microsoft’s patent titled “Intelligent tabular big data presentation in search environment”. Visual Azure Provisioning From a Whiteboard! On this week's Xamarin Show, James is joined by good friend Christos Matskas who shows off a beautiful Xamarin application that is infused with AI to generate a full Azure backend just by drawing pictures on a white board. You don't want to miss this mind blowing demo and walkthrough of the code. In this interview, Donovan Brown interviews Group Program Manager Aaron Bjork about Agile Planning. Last month, I delivered the one-day workshop Practical AI for the Working Software Engineer at the Artificial Intelligence Live conference in Orlando. As the title suggests, the workshop was aimed at developers, bu I didn't assume any particular programming language background. In addition to the lecture slides, the workshop was delivered as a series of Jupyter notebooks. I ran them using Azure Notebooks (which meant the participants had nothing to install and very little to set up), but you can run them in any Jupyter environment you like, as long as it has access to R and Python. You can download the notebooks and slides from this Github repository (and feedback is welcome there, too). Computer Vision API with R. Use an R script to interact with the Computer Vision API and generate captions for random Wikimedia images. Custom Vision with R. An R function to classify an image as a "Hot Dog" or "Not Hot Dog", using the Custom Vision service. MNIST with scikit-learn. Use sckikit-learn to build a digit recognizer for the MNIST data using a regression model. MNIST with Tensorflow. Use Tensorflow (from Python) to build a digit recognizer for the MNIST data using a convolutional neural network. The workshop was a practical version of a talk I also gave at AI Live, "Getting Started with Deep Learning", and I've embedded those slides below. This episode will introduce the use of IPFS (Interplanatory File System) in a consortium setting. The concepts of how this technology can be helpful to remove centralization of storage that is not part of the block in the blockchain is shown. Along with this is a short demonstration of how the marketplace offering for IPFS in Azure can make creating these storage networks simple is shown. Winvision has leveraged the spatial intelligence capabilities of Azure Digital Twins to build BeSense, a smart building application that provides realtime data that optimizes space utilization and occupant experience. Remco Ploeg, a Solution Architect at Winvision demos the application. The post MariaDB 10.2.21 now available appeared first on MariaDB.org. MyAnalytics is now available to more of our enterprise and business customers. 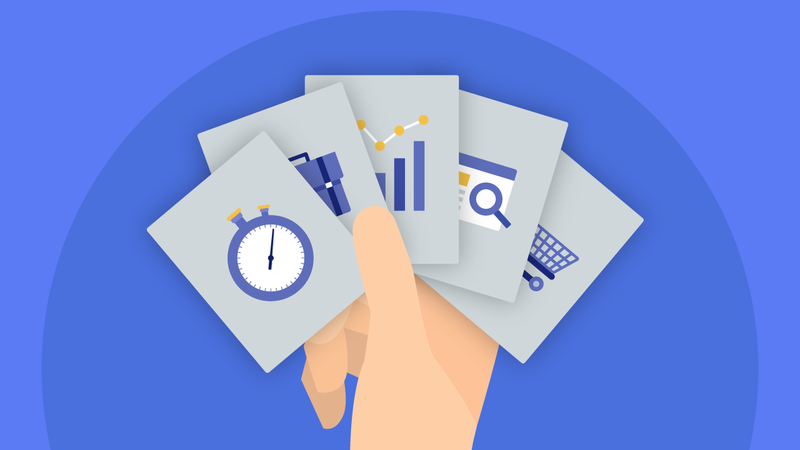 MyAnalytics helps you work smarter—from cutting unproductive meeting time to reducing time spent working after hours. It even uses AI to help you stay on top of your to-dos. The post MyAnalytics, the fitness tracker for work, is now more broadly available appeared first on Microsoft 365 Blog. In an age of increasingly sophisticated cybersecurity threats and regulations like GDPR, new offerings for Microsoft 365 address the growing need for security and compliance solutions. The post Introducing new advanced security and compliance offerings for Microsoft 365 appeared first on Microsoft 365 Blog.